SANTA MONICA, Calif., Oct. 1, 2009 - PRNewswire -- A number of leading environmental companies, associations, and organizations today announced their official support for Dot Eco LLC's application for the .eco top level domain. Dot Eco LLC is an organization dedicated to promoting the acceptance and implementation of the .eco top level domain, and is backed by leading ecological and philanthropic groups, environmentally conscious high-profile individuals, and leading scientific voices. "We are thrilled to join forces with these organizations to help further the Dot Eco initiative and raise awareness about the growing threats to our environment. These partnerships represent an important step towards the implementation of the .eco top level domain," said group co-founder Clark Landry. Websites ending in .eco will enable individuals to express their support for environmental causes, companies to promote their environmental initiatives and environmental organizations to maintain their websites in a namespace that is more relevant to their core missions. By charter and mission, over 50% of the profits of the .eco initiative will be distributed to support environmental causes. The .eco top level domain application of Dot Eco LLC is officially endorsed by Al Gore, the Sierra Club, the Alliance for Climate Protection, and Surfrider. The advisory board of Dot Eco LLC includes Davis Guggenheim (director of An Inconvenient Truth), Roger Moore (renowned actor and Goodwill Ambassador for UNICEF), Richard Muller (Author of Physics for Future Presidents and contributor to the Intergovernmental Panel on Climate Change) and Jim Dufour of the Scripps Institution of Oceanography. Green Aviation International is comprised of aviation professionals, visionary leaders and partners in the aviation industry, environmental experts, carbon experts, government agencies, and NGOs working to produce a number of practical, low-cost solutions to help airlines reduce their impact upon the environment. Green Aviation International plans to set up green and sustainable aviation subsidiaries as well as develop new aviation products and services for travel businesses and the flying public. Green Works Environmental Services addresses the growing needs of the business community by providing a range of environmental services and solutions. These services allow California businesses to become environmentally-aligned and compliant with federal, state, county, and city requirements. Carbon Smart provides their clients with regular insights into carbon-saving tactics, green technology and expert views from their academic panel of carbon specialists. Carbon Smart provides practical, intelligent solutions to help businesses reduce costs, win business, manage risk and engage stakeholders in the low carbon economy. The Renewable Energy Co-operative team (R-ECO) offers renewable energy implementation and renewable energy education. They provide solar photo-voltaic (PV) and solar thermal installations, ground source heat pumps, biomass boilers and micro-wind technologies. R-ECO has provided educational talks on topics such as off-grid renewable energy, climate change, environmental management systems and environmental impact assessment. Lighter Footstep has been a leader in practical green living. This popular green lifestyle website has appeared on NPR's All Things Considered, has been voted one of Read/Write Web's Top 35 Environmental Websites, and has been cited by Wikipedia, Lifehacker, Treehugger, and dozens of the Web's most popular destinations. GreenovationTV is the world's first internet TV channel for healthy, energy & water saving, green home improvements with a mission to help green the 130 million inefficient and sometimes unhealthy homes in the U.S., through practical advice and real solutions. Greenovation.TV delivers free 24/7 on-demand access to fast-paced and entertaining how-to videos that show all the ways to green a home and reduce energy consumption. Dot Eco LLC also recently announced that renowned activist, Mark Massara, joined the initiative as its Chief Policy Officer to oversee policy development and legal concerns for the new top-level domain. This came shortly after Jim Dufour, Associate Director at Scripps Institution of Oceanography's Instrument Development Group, joined the initiative as the group's Chief Environmental Officer. Dot Eco LLC was founded by Fred Krueger, Clark Landry, and Minor Childers to secure, operate and promote the .eco top level domain in order to promote environmental initiatives and awareness. 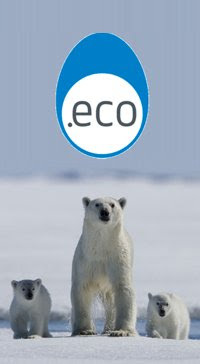 Dot Eco LLC will be applying for the .eco top level domain through the ICANN gTLD application process in early 2010. For more information visit www.supportdoteco.com.